It has taken me longer to get settled into my new apartment than I had initially anticipated. I've been moved in for just over a month and a half, but only now is it starting to feel a bit like home. I loved the apartment immediately, we both did - and the thought that we had just missed out on it made it seem all the sweeter, I suspect. The stairway up to the second floor flat is narrow, but it opens into a spacious, bright (two skylights!) landing. The kitchen is another large, open, bright space - I haven't had a kitchen large enough to eat in since 2001. Luxury! The appliances and cupboard space are ample, which I consider a big plus. The bedroom is large and has a working fireplace. The other rooms have much to recommend them as well. Pleased as punch! Then we realized that the washer/dryer and dishwasher we had seen while viewing did not actually come with the apartment. Apparently they belonged to the previous tenant, a possibility which hadn't even occurred to me. Boned. Then we left for Toronto for a week and a half, abandoning our only-just-moved-in-not-even-unpacked-box-filled apartment. Upon our return we started the quest for furniture. You see, we moved to Halifax in our little '98 Corolla, Snowball, abandoning most of our worldly goods in Toronto before we left. The few larger items that we decided to keep - the bed, a few bookcases and a couple of desks - were generally lugged cross-country by G's father (again, a million times thank you). We quickly realized that we were missing a few key items: dishes, for example. And chairs. Also a couch, television cutlery, bedside tables, sewing table, lamps and dressers. We've since made these purchases (along with a number of others. A large number) and have gotten the apartment arranged pretty much how we want it. There are still a few things to do, like framing and hanging the rest of the art, but we're getting there. Nothing like stuff to make you feel at home! I knew I was finally settled when I got my bookcases in order. I love my books, and I like having them out where I can see them. But how to display them was a bit of an issue, as I have a lot of them and didn't want to just mash them together onto shelves. I wanted the shelves to look like I put some thought into it. Once I got the books out of their liquor store boxes (the best for moving books), I decided to try something a little different. Rather than arranging the books by subject or author as I've done in the past, I opted to adopt the idea of a good friend of mine and arrange them by colour. I believe it turned out fabulously, and I love it. It makes me happy - my books are out on display and just look so darn good! 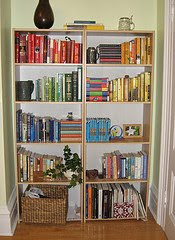 Your bookcases are very inspiring! 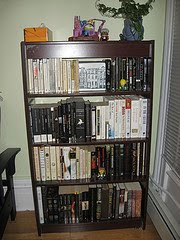 My books are vaguely arranged by size, but mostly all hoi polloi. AND I have those same IKEA magazine holders that you have on your bottom shelf. Hooray for Ikea! I miss Ikea . . ..